The Montreal Children's Hospital Trauma Director, Debbie Friedman appeared on CTV national news to discuss concussions in minor hockey and other contact sports this week. If you missed the report, watch it here. 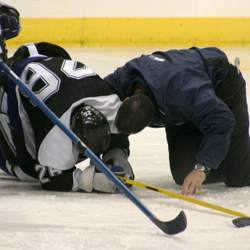 The Montreal Children's Hospital Trauma Program reminds coaches, parents and players to recognize concussion symptoms early on, seek medical attention and never play through an injury. Your child or teenager must be completely symptom free at rest for one week before returning for physical activity. At that point, a gradual increase in exercise intensity over a few days is recommended prior to full return to play. for more details click here.